Ruime livings met min of meer open (woon)keukens. Het typeert de appartementen én maisonnettes in Narva Eiland West. Variatie is vooral te vinden in de ligging, het aantal kamers en de vorm van de royale buitenruimtes. Dit type woningen is op diverse locaties binnen het complex te vinden. Allemaal net weer even anders, allemaal even comfortabel. Groottes tussen de 86 en 153 m2. Prijzen van € 454.761 tot € 790.129. These newly built apartments and maisonettes offer everything you need. Live comfortably on one floor, or spread out over two (the maisonettes have a separate entrance). And every apartment has fantastic outdoor space, making every day feel like a holiday. 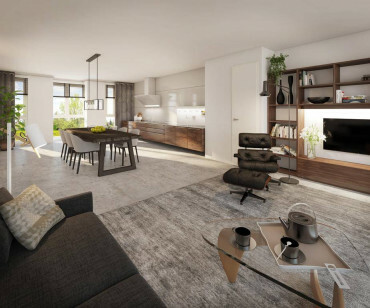 These apartments and maisonettes have spacious living rooms with more or less open kitchens (some spacious enough to include an eat-in area). All of this can be found in the apartments and maisonettes of the Narva Eiland West complex. The variation is mainly to be found in the location within the complex, the number of rooms, and the nature of the spacious outdoor areas. These types of residences can be found at various locations in the complex. Each home is unique, and every home offers supreme living comfort. The apartments and maisonettes vary in size from 86m2 to 153m2, and the prices range from €454.761 to about €790.129.